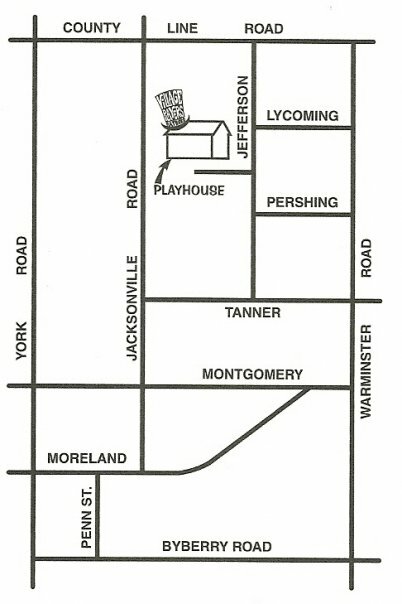 The physical address for the theater is located at 401 Jefferson Avenue in Hatboro, between County Line Road and Tanner Avenue (please do not send mail to this address). Jefferson Avenue comes in off County Line Road between Warminster and Jacksonville Roads. We are next to Tanner Park. In addition, we are less than a mile from the Hatboro train station (Septa R2 line) and Main street Hatboro. We have on-site and street parking available. See below for driving directions from various starting points. North on Route 611 (Doylestown). At first traffic light, make a hard right on Mill Road. Stay on Mill Road. Continue straight at first traffic light. Road changes name to Warminster Road. Stay on Warminster Road for two traffic lights. Cross over Byberry Road and stay on Warminster Road. After about 7 streets on the left, look for Pershing. Left on Pershing. This is only a block long. It will dead end at Jefferson Avenue. Take Route 611 (Broad Street) north. This will become Easton Road. In Willow Grove, just past the Burger King, Route 611 will merge with Route 263 (Old York Road) for a very short time. Merge right and continue on Route 263 (Old York Road). After you pass under two bridges, at the next traffic light, make a right on Warminster Road. Stay on Warminster Road for two traffic lights. Stay on Street Road for about 25 â€“ 30 minutes. Left on Jacksonville Road. There is a Wal-Mart on the corner. Stay on Jacksonville for about 1.5 miles. At County Line Road make a left. Stay in the right lane for about ½ mile. Make a right on Jefferson Avenue. Theater is about two blocks down on the right. Stay on County Line past Route 611 (Easton Road) and Route 263 (Old York Road). After the railroad tracks, there is a traffic light. Continue straight.